The vision of Rainier Scholars extends beyond college graduation by creating leaders who embrace the challenges facing our country and our world. Cultivating professional networks is a critical part of this process as our scholars build rewarding careers. The work of Rainier Scholars as a catalyst within our alumni circles creates meaningful opportunities and powerful moments. 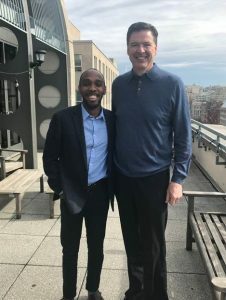 Jamari Torrence (Cohort II, Howard University, political science grad) recently experienced such an opportunity – connecting with James Comey, the former FBI Director. The meeting was set up by Stella Choi, COO at BlackRock who has long been a supportive and engaged corporate partner with Rainier Scholars. Their company commitment in supporting internships, financial literacy and career development activities for our scholars has created a strong partnership. Jamari and Comey exchanged contact information. Jamari hopes this new connection will support his future career ambitions as well as his desire to make a positive impact as a leader in this world. Thank you Stella Choi, for creating the opportunity, and thank you Jamari for representing the vision and hope of Rainier Scholars.